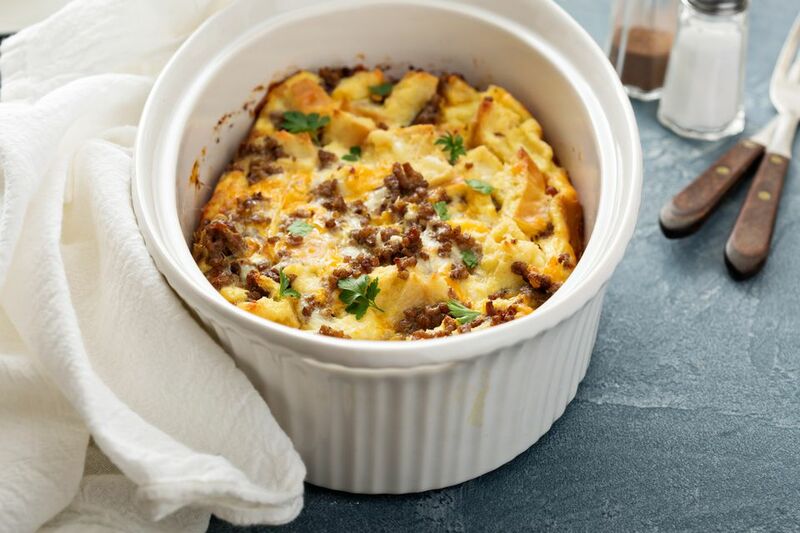 Breakfast casserole with sausage is one of the most popular varieties of the popular breakfast dish, and this vegetarian egg casserole recipe means that carnivores and vegetarians alike can enjoy this breakfast together. This recipe uses a vegetarian sausage substitute in place of meat, but other meat substitutes can be used if you prefer. Be sure to prep it the night before so all you have to is pop it in the oven in the morning! In a skillet, saute the sausage and onions in cooking oil or spray for about 5 minutes, until lightly browned. Layer sausage in the bottom of a 9-inch by 9-inch pan. Cut bread slices into one-inch strips and layer them across the sausage. In a small bowl beat the eggs and milk. Pour egg mixture evenly over the bread slices in the pan. Sprinkle with shredded cheese. Bake egg casserole, uncovered, for 35 to 45 minutes, until golden on top. Enjoy with whole wheat toast and a hot cup of coffee. Gimme Lean Sausage is just one option for a vegetarian meat substitute. Other brands, such as MorningStar Farms, also offer vegetarian sausage substitutes. Look for sausage substitute in the refrigerator or freezer section of your local grocery store or natural food store. If you don't like meat substitutes, or just don't want to eat them, there are plenty of other options for this breakfast casserole. Other choices for meat substitutes include tofu, tempeh, seitan, texturized vegetable protein, jackfruit, mushrooms, lentils, beans, or legumes. Looking to boost the nutrients in your breakfast? Consider adding spinach. Low in calories, spinach is rich in Vitamin K, Vitamin A, manganese, folate, magnesium, and iron, among other vitamins and nutrients. Consuming spinach may also have an anti-inflammatory effect and help protect against heart disease and certain cancers. Sprinkle a cup or so of fresh baby spinach, chopped or whole, into your egg mixture before pouring it into the pan.